Almost nobody’s first hanging leg raise looks even remotely passable, and that’s okay. Over time, as the abdominal wall thickens and strengthens as well as the hip flexors, this movement will start to take on a sort of elegance that few other exercises exhibit. The hanging leg raise is a staple in gymnastics training, which should give you an idea as to the kind of strength it builds. It blasts the entire abdominal wall — nothing escapes it. Not to mention, it strengthens the hip flexors, the back, and the grip. It is the ultimate ab exercise. The hanging leg raise is the ability to hang from a bar and fold yourself in half. This movement requires not only a great deal of strength but also a lot of flexibility. When most people first attempt this movement, they have a tendency to lean back or to swing their legs up to compensate for their lack of strength, flexibility, or both. Although both of these options make the movement easier, you should try to avoid them. 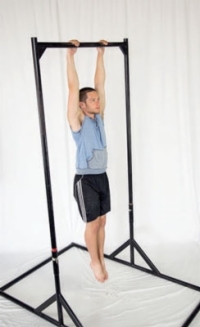 1Hang from a pull-up bar (or a set of gymnastic rings) with a shoulder-width grip. Tighten everything up as if you’re in a plank position and flatten the arch out of your back. Flattening your back will help prevent using sway or momentum to complete the movement. From time to time, you may want to experiment with various grip positions. 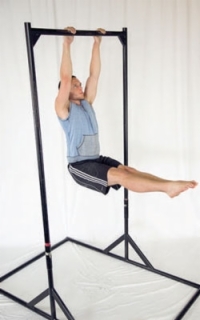 Occasionally, you can try the hanging leg raise with a narrower grip (hands together) or a wider grip (outside shoulder-width). 2Without leaning back or bending your elbows, raise your toes up toward the bar. Think of trying to pull the bar to your feet throughout the movement. Doing so will help engage your lats (armpit muscles) and supercharge your abs. 3When your feet reach eye level, lean slightly back if you have to but only as much as you need to. The hanging leg raise is complete when your feet reach your hands. It should almost look like you’re performing a toe-touch stretch. 4Lower your legs back down in a slow and controlled manner, and repeat. To make this movement easier, first bend your knees before using momentum or leaning back. The more knee bend, the easier the movement, which is why the hanging knee raise is the first step toward the full hanging leg raise. 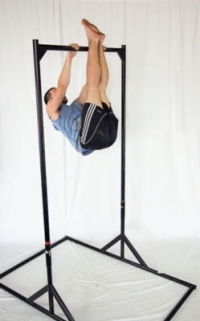 So to progress toward the full hanging leg raise, slowly start to extend your knees further and further until you have achieved full extension. This may take a while, but it works.